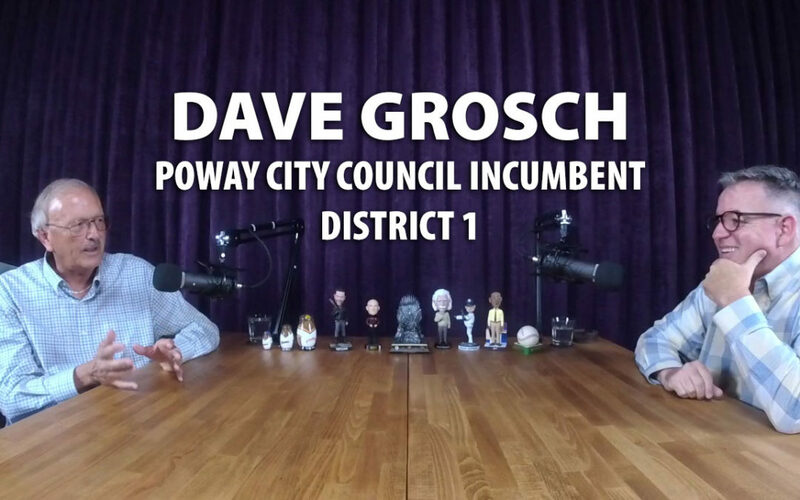 Poway Councilman Dave Grosch joined me Friday afternoon October 12th for a conversation about important Poway issues, his family history in Poway and a little bit about the MLB playoffs and college sports. Dave is well known and takes great pride in being an approachable and available councilperson that will meet with constituents, listen to their concerns, respond to their emails and take their phone calls. He wants to be responsive to the people of Poway to help them solve problems, represent their concerns and share information about issues involving city council. Councilman Grosch shared his thoughts about the Poway Road Corridor Plan. He believes the new Outpost project will be a strong showcase of the potential of the redevelopment plan. Once people start seeing something real, then many concerns and unfounded rumors will lessen. He did make it clear that property owners still need to gain approval from city council on their plans. In one specific case, a property owner shared plans for a mixed use development, but it only had 10% commercial and ultimately was rejected by the city council. Dave is particularly concerned about parking issues. He sees the overflow parking on Oak Knoll, Community and other streets today. It is important to him that each new development on Poway Rd has the necessary parking set aside to ensure there is no additional overflow on to side streets that are already impacted. Grosch is also proud of the city’s fiscally conservative policies. Balanced budgets, prioritization of special projects and prudent management of tax dollars are key principles for Councilman Grosch. But he warned that expenses are increasing at a higher rate than revenues, so new revenue sources will be necessary. Because many long time residents choose to remain in their homes and retire in Poway, there is less turnover of homes and thus the property tax base grows very slowly. Part of the reason for the Poway Rd Corridor Plan is the opportunity to generate more sales tax and property tax revenue which will allow the city to continue to fund the growing needs of public safety, parks, infrastructure and more. Dave did speak to the issue of term limits. This was an issue he felt passionately about when he first ran for office in 2010. However, he realized it took him time to come up to speed as a councilman to understand the city staff and how processes worked. He also felt he had unfinished business to address (Community/Senior Center, Espola project, getting Poway Rd Corridor project started, etc.). After consultation with his supporters he decided to run for a 3rd 4-year term. We covered many other issues including Stoneridge, synchronizing street lights, expanding the left turn lane at Pomerado and Poway Rd, Poway Girls Softball, Poway National Little League, SAIC, TRW, raising a family in Poway, losing 8 pounds walking neighborhoods meeting with voters, Potato Chip Rock, Starridge Park, Silverset Park, Poway Road traffic, big rocks underground in Poway, the big dig at the Outpost, Loyola Marymount, Hank Gathers, Bo Kimble, Torrance, the huge Mira Mesa apartment complex off the 15 freeway, the new Poway Community Center/Senior Center, cleaning up the eucalyptus trees on Twin Peaks Rd, LMDs (Landscape Maintenance Districts), Torrey Powers, John Carson, Phil Spear (RIP), VFW, Kiwanis, water rates, taking an hour to get a gallon of milk at the grocery store because he talks freely with constituents, figuring out the weird TV channels for Aztec football and basketball, Padres constant rebuilding mode, Rocky Long, a possible Brewer/Astros World Series and his inaccurate prediction that this evening’s Aztec/Air Force game wouldn’t be played in a rain storm.